VALLEY VISION is a non-profit 501(c)(3) production company that produces Public, Educational, and Government (PEG) television programming for Conway, Albany, Bartlett, and Fryeburg on channel 3. We are funded primarily by cable franchise fees provided by the Town of Conway. We also receive contributions from the towns of Albany and Fryeburg, as well as business sponsors and our members. No part of Valley Vision’s budget is derived from tax dollars. Valley Vision’s broadcast schedule is available on this website, in addition to the Mountain Ear and on the channel 3 community calendar. We may also be viewed on channel 121-1, for those televisions capable of tuning that channel. Bill holds a Bachelor’s Degree in TV Production and does most of the studio production and editing that goes into our daily schedule of programs. He was formerly the station manager from 1998-2001. 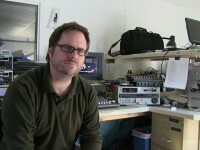 The “voice” of Valley Vision sports for fifteen years, Rick brings his talent to the play by play on hockey, football, baseball, and softball for Kennett High School and Fryeburg Academy sports. Rick also coordinates all the administrative responsibilities at Valley Vision and keeps things organized to facilitate the operation of Valley Vision. He opens the office for business between 10am and 2pm Mon. – Thurs. John has been a vital part of the channel 3 videography team for several years. John especially enjoys sports and nature videography, in addition to his time on the golf course. Bob has been with Valley Vision since 2000, serving in many capacities including videographer, editor, board member, and President. Bob also constructed the Valley Vision studios in 2001. Laura has been with Valley Vision for since the early 2000’s. She currently videotapes most of the municipal meetings and the occassional sporting event. She is passionate about animal welfare. Alan has been Valley Vision’s primary sports videographers for over 15 years. A skilled hockey player himself, Alan especially enjoys videotaping Kennett High School’s hockey games. Scott joined Valley Vision in 2012, bringing decades of experience as a videographer with him. Scott produces all live remote events, including Kennett football, hockey, basketball, and Kennett graduation. Scott also fills in for station manager Bill Edmunds from time to time. The Valley Vision Board of Directors is comprised entirely of unpaid volunteers. Selectmen of each town in our viewing area may choose one individual (“town Rep”) to represent their town on our board. Several other board members serve as members at large, bringing a wide variety of technical, creative, financial and public service backgrounds to the organization. Prospective members may nominate themselves for election by the existing board.